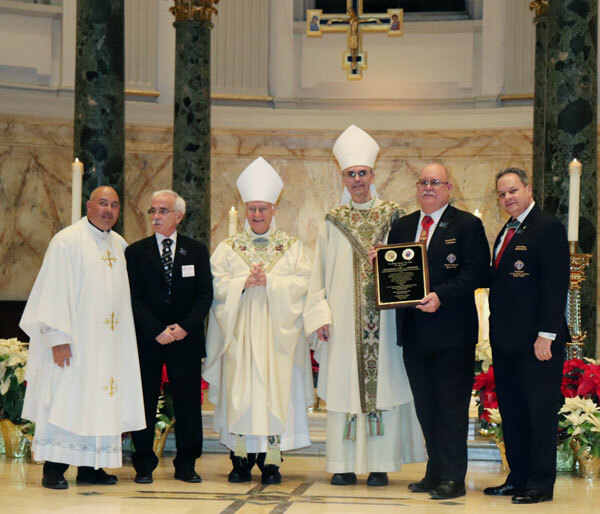 When the Long Island Chapter of the Knights of Columbus of Kings and Queens counties rededicated itself to the fight in defense of every human life at its Pro Vita Mass this year, they were one council stronger. St. James Cathedral Basilica in Downtown Brooklyn was both the host of the annual Mass and home of the newest council: the Bishop Thomas Vose Daily Knight of Columbus Council No. 1700. “We are very eager here at St. James to work with all the councils throughout Brooklyn and Queens to serve,” said Father Peter Purpura, the rector of the cathedral basilica and chaplain of the new council. Therefore, he said, all are worthy of protection, from the unborn to even those who have hurt others and may be in prison. Auxiliary Bishop Paul Sanchez, who was the main celebrant of the Mass, praised the Knights of Columbus for their witness and good work in spreading values not embraced by the larger society. Three awards were given at the end of the Mass by Father Michael Gelfant, the associate state chaplain of the Knights of Columbus. 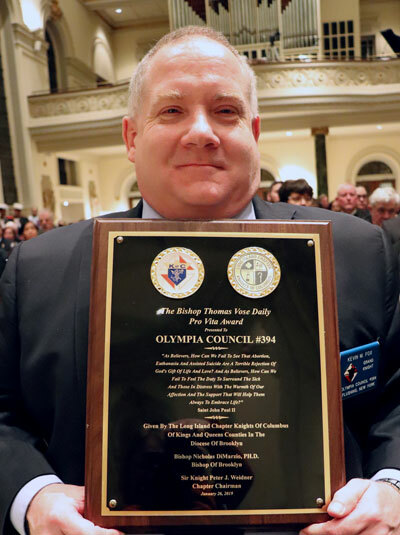 He presented the Bishop Thomas V. Daily Pro Vita Award to Olympia Council No. 394 in recognition of its work donating $30,000 to buy a sonogram machine for New Beginnings Center of Hope, a pro-life facility in Queens. Father Gelfant praised the organization for its work to help women better understand the life they are carrying, giving them the tools and information to help them make a life-affirming decision. Alecia Jones, executive director of New Beginnings, said her organization has been seeking funding to buy such a machine. The sonogram machine is used on-site by a qualified specialist from My Choice Pregnancy Center. The grand knight of Olympia Council, Kevin M. Fox, said the Knights are always looking for ways to help the area they have served since the late 19th century. The council is hosted by Mary’s Nativity-St. Ann parish, Flushing. “I’m happy to know that the little we could do has done good in the community,” Fox said. A Bishop Thomas V. Daily Pro Vita Award was also awarded to Supreme Knight Carl Anderson, who was unable to attend due to a last-minute conflict. 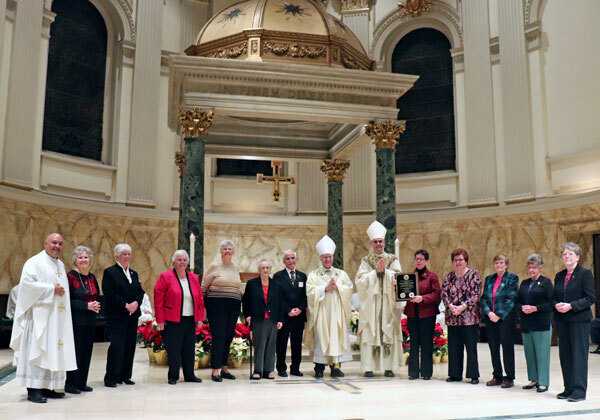 The Father Michael J. McGivney Medal for Life was presented to the religious Sisters of Mercy of the former Angel Guardian Home, Dyker Heights, where they cared for orphans for over a century. Father Gelfant praised the religious sisters for their life-affirming work and read each sister’s name carefully and out loud. He recognized them for all of the lives they have touched, and helped set on the right path, including many Knights of Columbus who were once orphans in their care. Congratulations from all of us at The Bridge to Life,Inc. to all of the honorees. We need witnesses to life in NY now more than ever.